Born: April 9, 1843 in Sandwich Ma. 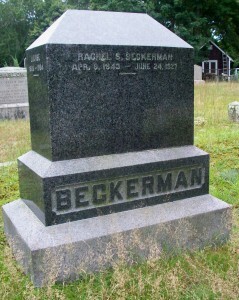 Died: June 24, 1927 in Bourne Ma. at 84 yrs, 2 mos, 15 d.
Married (1): December 25, 1861 in Sandwich Ma. To: John Albert Beckerman, Capt. ; (1819 – 1887) (Gerard Beckerman & Margaret (–)); John married (1) Ann Phillips Kendrick (1829 – 1859) (Solomon Kendrick & Anna (Phillips) Weeks) on Abt.1849; John also had an illegitimate son with Harriet T. Wright in Sandwich Ma. on October 17, 1876. 1. Sarah Lewis Beckerman Barlow; (October 23, 1861 – 1921); Married Jesse Frederick Barlow (1860 – 1930) (Jesse Bartlett Barlow, Capt. & Susan Harlow (Westgate)) in Bourne Ma. on November 1, 1893; Sarah & Jesse are buried in Pocasset Cemetery. 2. 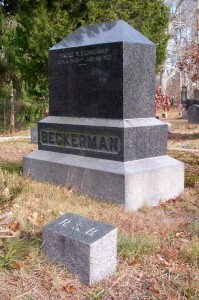 John Albert Beckerman, Jr.; (February 20, 1873 – May 5, 1944); John A., Jr. died in Bourne Ma. 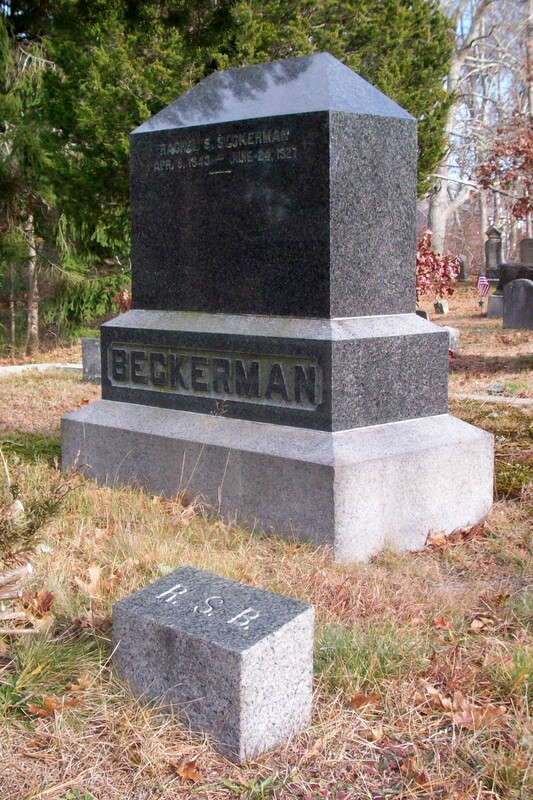 at 71 yrs, 2 mos, 15 d.; He is buried in Pocasset Cemetery (headstone not located; E.D. Nickerson interral records). 3. William/Willy Herbert Beckerman; (July 7, 1879 – 1948); Married (1) Evelyn Carlisle Tilton (1883 – 1917) (Alonzo W. Tilton & Chloe L. Weeks) in West Falmouth Ma. 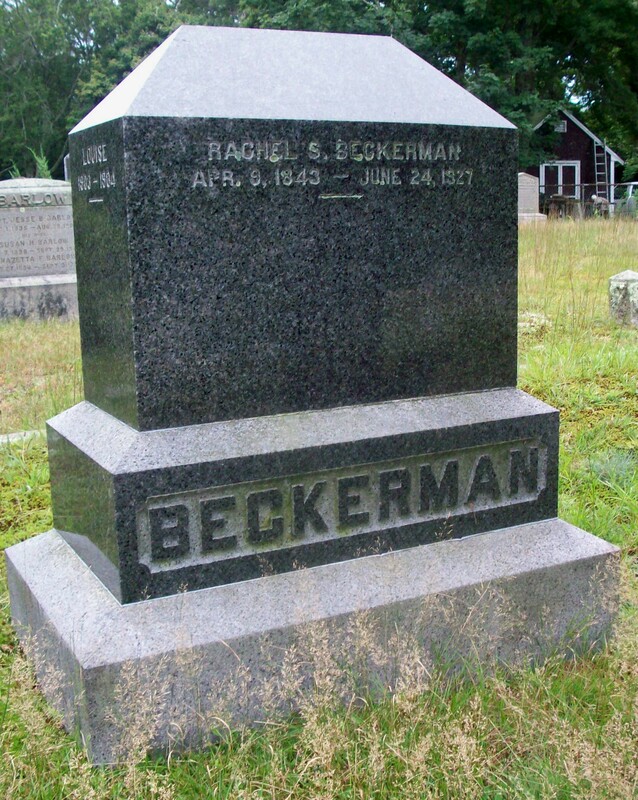 on August 14, 1901; They had 5 children, one of whom, Louise Evelyn Beckerman, is buried in Pocasset Cemetery; William/Willy married (2) Mary A. (–); Evelyn is buried in Oak Grove Cemetery in Falmouth Ma. with her parents. To: Marcus Morton Thompson; (1840 – 1900) (Lewis Thompson & Huldah Wood); Marcus married (1) Susan M. Nichols (1841 – 1882) (James Gilbert Nichols & Lucia M. (–)) in Halifax Ma. on January 9, 1869 & married (2) Mary A. Barlow (1848 – 1897) (William Allen Barlow, Capt., Dea. & Achsah Dimmick) in Middleboro Ma. on October 28, 1883.